Vintage Breaks is a must have for any DnB, Funky Breaks, Dub Step and electronic music producer. With 380 original license free samples this will be your go to source for vintage breaks. All performed live by New York drummer Evan Pazner. The loops were made using a late 1960's Ludwig drum kit similar to the kit used in the famous Amen break. The loops were created in various tempos and formats to meet the needs of the producer just starting out and the more advanced user. Vintage Breaks contains Apple Loops, Rex 2, Acidized Wav as well as one shots to create your own patterns and as a Refill for Reason users. The pack was produced and recorded by Lenny Dee and Derek Nievergelt at the Tight Spot Studios in Brooklyn New York with the breaks edited, reworked and mixed by ISR's head sound designer BHK to give you perfectly cut authentic sounding grooves that are totally usable in today's modern music production. The drums were recorded in a dead room to limit the room reflections and standing waves giving you more flexibility when using the breaks in your track. Various microphones and vintage pre amps were used in each recording to give you that old school record style feeling with out compromising on the quality of the drum sounds and loops. All the loops are pumped up while leaving head room for you to add your own effects & Eq. If your looking for that kicking old school break this pack contains all you need to produce the hottest drum tracks in any style with out having to dig into record crates and take breaks from old recorded music (and run into Copyright issues). 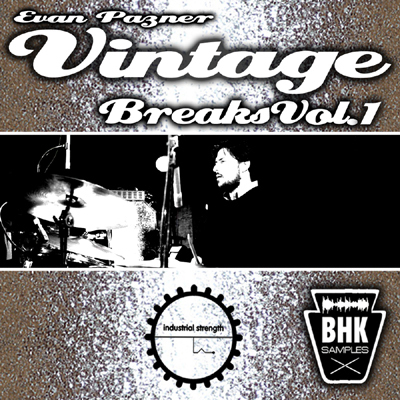 Evan Pazner Vintage Breaks is the perfect solution for your production needs to get that true vintage sound in your productions. CLICK HERE for info on pack and producers.